With September in full swing and that back to school feeling on the return, now is the time to shake off the summer blues and turn thoughts to getting back down to business. 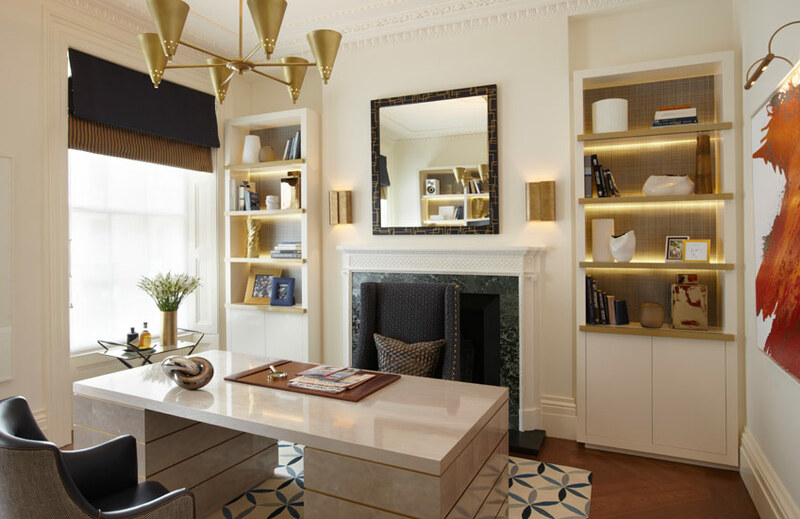 Revamping your work surroundings is one of the most effective ways to refresh and re-motivate the mind, and any interior designer will tell you that the finest (and often most productive) home offices start with the right desk. It’s not only the focal point of your room but also that all-important hub where you can make things happen. Not sure which desk is for you? 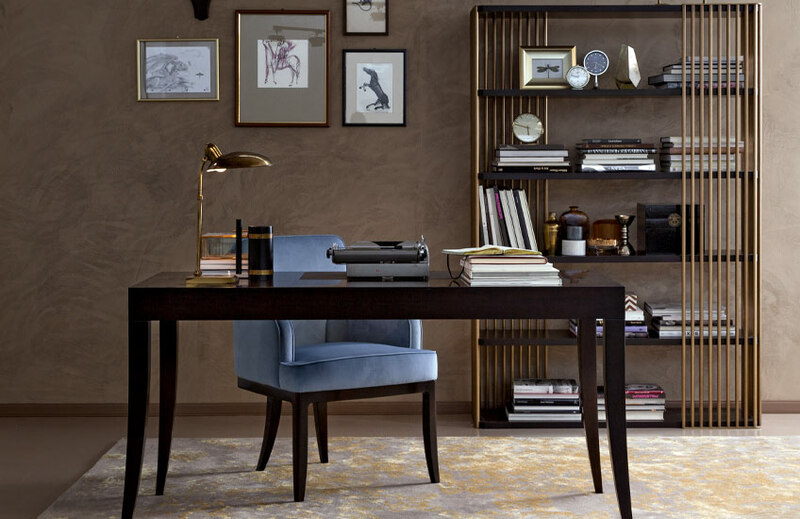 We round-up six styles that will get the best out of you and your home office. 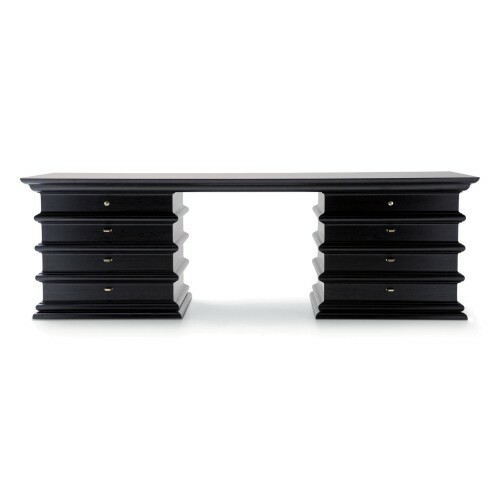 The pedestal desk is having an undoubted revival. The style draws its inspiration from the classic Partners desk, which is characterised by two grand pedestals with drawers and cupboards at either side, designed to enable two banking partners to sit opposite one another. 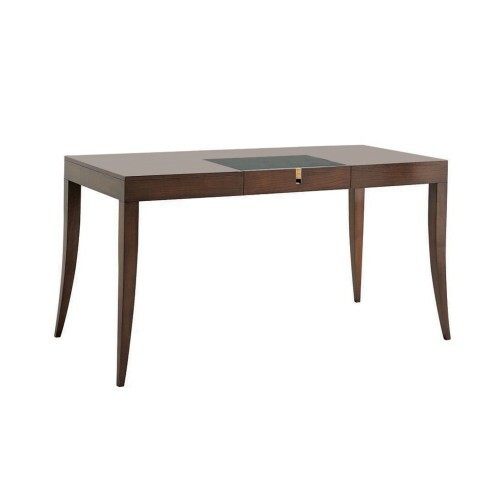 Traditionally, pedestal desks were finished with tooled leather inserts and brass fittings, but today’s modern reinterpretations offer sharper silhouettes, new wood stains and decorative contemporary twists. Justin Van Breda London, for example, reinvents the style in a light greyed oak with lattice motifs this season, while British brand Davidson updates its own take on the design by contrasting the sleekest polished brass handles against a glossy black backdrop. The best thing about the age-old writing desk is that it will never go out of style. 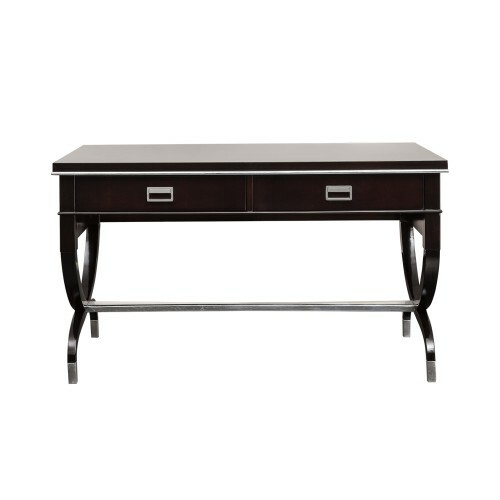 A classic timeless, just like a Chesterfield or a wingback chair, any take on the traditional writing desk will serve you for generations. 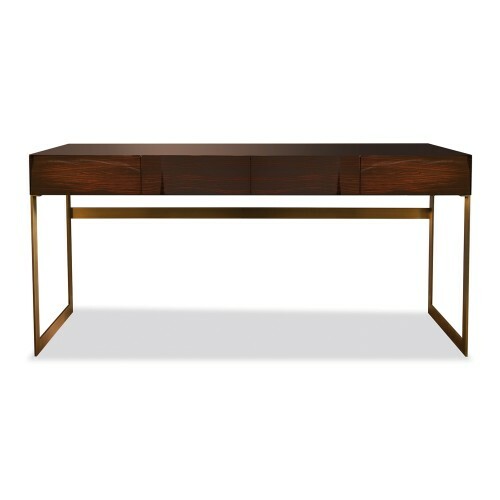 Distinguished by slender proportions (think a narrow surface and thin tapering legs), this style isn’t equipped to display large desktop computers and printers, but it makes a perfect spot for hand-written work or a sleek laptop. It also goes by the name of ‘bureau plat’, which translates to ‘flat desk’, and usually has a series of small drawers for storing office equipment. Modern-day styles don’t come with an inkwell like the antique designs, however the majority do still feature a leather writing pad. Many brands (look to Oasis and Dom Edizioni) also choose to keep the raised top section, which was originally intended to maintain writers’ privacy and protect their work. Whilst rich woods are typically the material of choice for this desk type, many designers are breaking the mould by veering away from an all-wood design. 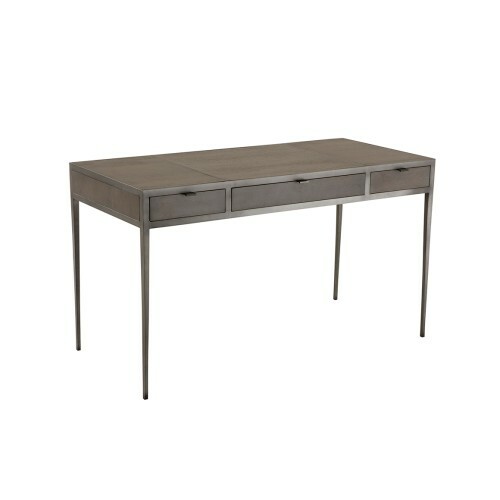 Oasis’ Proust writing desk, for example, throws a svelte satin bronze base and toffee-hued leather panels into the mix. 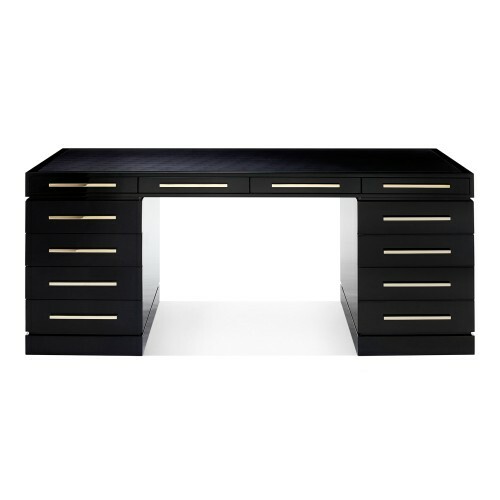 Working the X-factor (quite literally), a cross-base desk is a great choice if you’re looking for something a little more decorative. They look less chunky and overpowering than many other styles, which makes them a perfect solution for smaller office spaces. Versatility is also a large part of their appeal, as the cross-base can tap into several looks. Curved lines are synonymous with 1920s designs, for instance, so many cross-bottom designs offer an easy way to channel an Art-Deco mood. Whilst linear versions, from the likes of Eichhholtz, achieve a slick ultra-modern aesthetic. 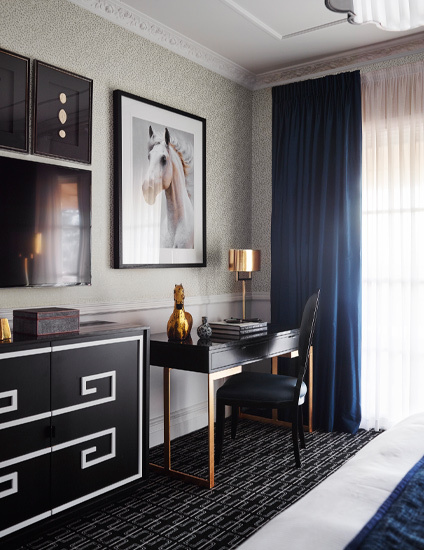 Less heavyweight than the pedestal desk, these lighter designs look best when styled with a considered selection of accessories, as opposed to being overloaded. And if you’re going to invest in this style – remember it’s one that’s made to be shown off. Showcase the design in an open area of the room and style it with slight office chairs. This will let the base take its rightful centre stage. 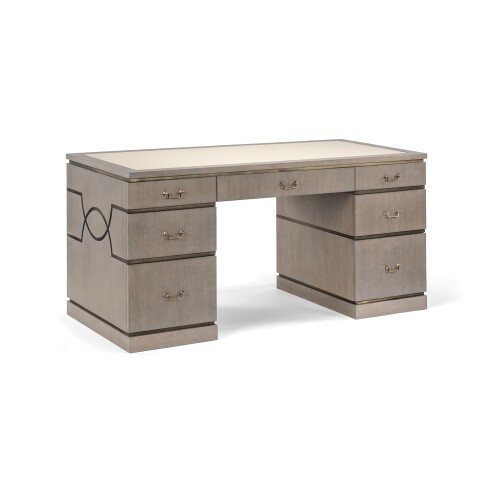 There’s no better way to introduce a luxurious vibe to your home office than embracing a desk with metallic impact. Whether you opt for a design with subtle polished details or one that stands on a high-gleam base, these radiant styles will grab instant attention. They shine best in modern spaces and look incredible when dressed with metallic desk accessories. 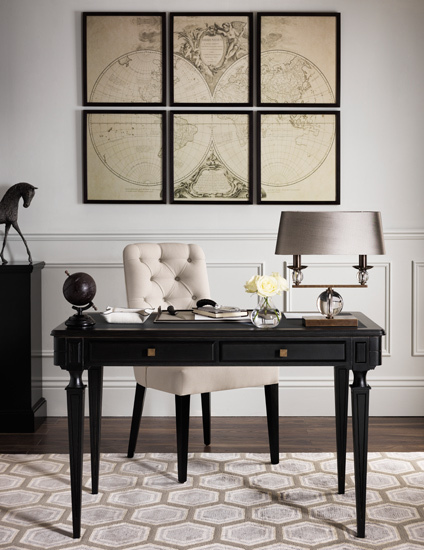 Not short on variety, there are endless styles out there from super-sleek sled base desks to thoroughly statement-making designs, such as the astronomically-inspired Galileo desk by Eichholtz. Extremely durable, metal desks also promise to last for decades. Remember to consider colour and finishes carefully to help you achieve your desired aesthetics. Warm golden and bronze tones will always feel opulent, whilst cool silver hues can take your space in a more industrial direction. Antique brass is one of our favourites when it comes to working a luxe rustic look. To add another plus point, metallic surfaces are effective at maximising a sense of light and space. Use your beaming design to bring a flash of light to a dark corner. 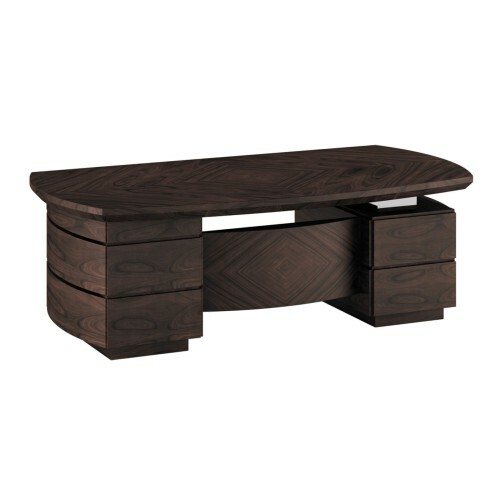 Whether you want to add voluptuous body to your space or introduce slinky serpentine lines, curved desks make a striking choice. Their rounded silhouettes immediately set them apart from the majority of desks, which are traditionally angular, and help to bring a softer dimension to room schemes. Selva’s Downtown pedestal design demonstrates the curved desk’s ability to take on a modern guise and Smania’s Presidential desk is proof that contemporary curved designs don’t have to compromise on the grandeur you get with classic styles. 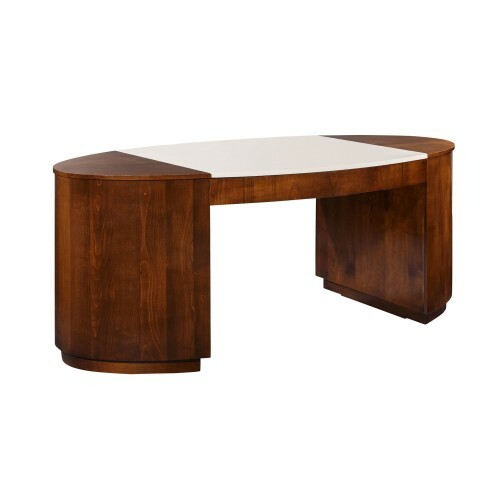 As with any desk, curved designs can be elevated with the right styling. Pay thoughtful attention to the silhouettes of your desk accessories and chosen chair to create a high-impact space. Angular office chairs make a strong contrast, while rounded desk lamps and accents can be used to beautifully complement your desk’s curving profile. A suitable option for minimalists, the simple sleek silhouette is guaranteed to please. 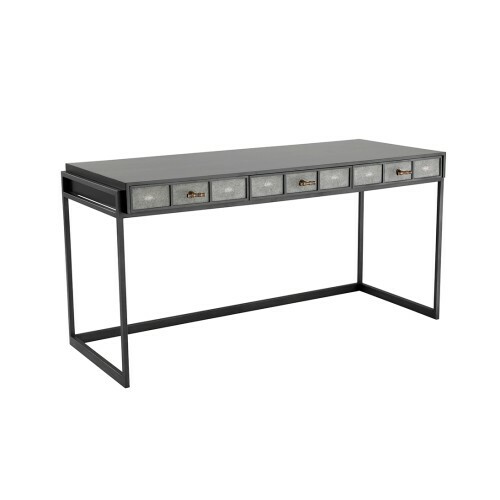 This is another style of desk that feels resolutely modern and carries a smaller footprint, meaning it will slot neatly into more compact offices. 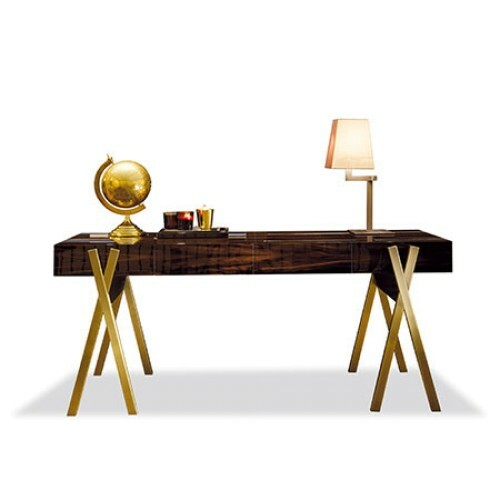 A real multitasker that can cater to various rooms, sleek desk styles can come in all shapes, sizes, materials and finishes (and that’s what we love most about it) but one thing they all have in common is casting a svelte shadow. Here, Selva’s Jubilee design is all about a streamlined shape, and it works a deliberate lack of carving and details to allow its figure to take the limelight. Another reason sleek types tick the box is because they call to be accessorised with equally understated accents, which makes effortlessly beautiful desk dressing come almost instinctively. Embrace this style to champion neat proportions and clean lines.